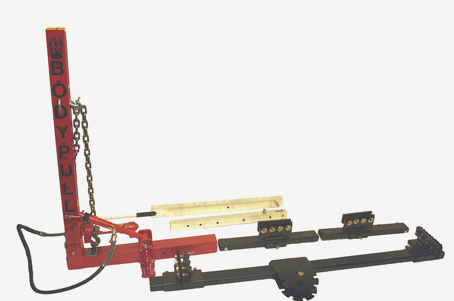 BODY PULL WITH 4 TON RAM, PUMP, CHAIN/HOOK, 1 PULL AND UNIBODY 4 CLAMPING SYSTEM. BODY PULL PULLING POST IS MADE OF ALUMINUM, WHICH MAKES IT LIGHT AND VERY STRONG ONLY 48LBS, AND IS 46 1/2" LONG FOLDED UP. THE PULLING TOWER IS 49 1/2" TALL WITH 11 ADUSTABLE PULLS, AND THE BASE EXTENDS TO 7 FT IN LENGTH. FINISH ON TOWER AND MAIN BASE IS POWDER COATED IN RED OR BLACK. BODY PULL IS MADE IN THE USA. THE 4 TON RAM, PUMP AND ACCESSOREIS ARE FOREIGN MADE. 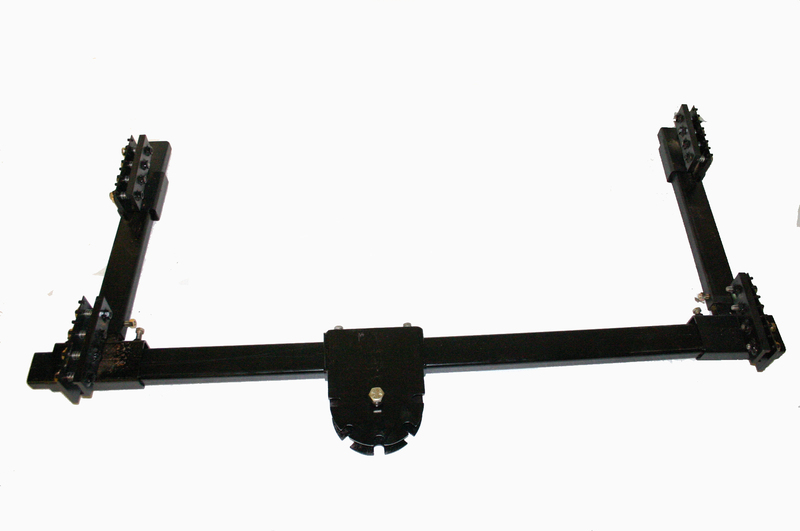 THE ALL NEW PATENT PENDING 5 POINT UNIBODY CLAMPING SYSTEM SLIDES UNDER MOST VEHICLES WITHOUT HAVING TO LIFT VEHICLE UP, AND CONNECTS TO THE PINCHWELDS WITH CLAMPS. NO NEED TO USE FLOOR PODS TO CHAIN VEHICLE DOWN TO. NEW 5 POINT SYSTEM PERMITS USER TO ROTATE PULLING POST TO 5 DIFFERENT PULLING POSITIONS WITHOUT REACHING UNDER VEHICLE AND HAVING TO REMOVE ANY PINS. QUICK SET UP AND EASY TO USE.